The Very Best in Adaptive Motion Technology! The Precor AMT 885 Adaptive Motion machine is the very best when it comes to a freestride motion machine. This innovative design is going to create a pattern based on your body’s motion and exertion. You can easily switch between a stride length of 0″ all the way up to 36″. The AMT 885 will also let you adjust the height of your stride from 6.8 to 10″. This really is a premier machine from a top manufacturer. Unfortunately, the price reflects this leap in quality. In order to bring this machine into your home, you will need to pay over $12,000. For many, this price is too restrictive. However, we would recommend that you also check out the NordicTrack Freestride Trainer machines. They have a similar adaptive motion design and cost much less. Precor AMT 885 Adaptive Motion Trainer Sale! The Precor AMT 885 Adaptive Motion Trainer on sale for $12,395. You should also check out the NordicTrack Freestride Trainers for a similar machine design and MUCH lower price! 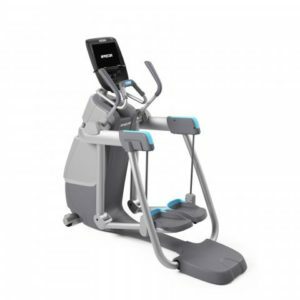 Precor is a premier brand with high attention to detail, innovative designs, and obsessive quality control. We’ve always been quite pleased with their customer service and impressed with their equipment. The AMT 885 is a unique design with adaptive motion technology. This means that the machine is going to adjust its pattern to match your body. You can effortless adjust the stride length and height to vary your workout motion. This will allow you to work all of the muscles in your lower body. If you like the concept of an AMT machine, you may also want to check out the AMT 833 and AMT 835 for a lower price. Or, the NordicTrack Freestride Trainers offer a similar design, although not up to this level of quality, for a MUCH lower price. When you’re talking about quality – it simply does not get any better than this! This is a solid and stable machine that will last and last. It is built from well-designed components that are backed by a 10 year warranty. Working out on this machine is truly unique. You will love how the stride length and height adapt to your body’s motion. You will be able to easily transition from long ground-covering strides, to short up-and-down type motions. This will help you make the most of your workout and target ALL of your lower body muscles. The motion controls on this machine are very intuitive to use. The dual action design will allow you to work out your upper body as well. The AMT 885 comes with a 15″ Touchscreen console capable of guiding you through your workout. It is highly customizable in 9 different languages. It comes with a variety of exercise programs including weight loss, fat burning, manual rolling hills, peak climbing, intervals, 5K and more. There’s honestly not much we can complain about with this machine. It’s pretty spectacular. You just need to decide if you are willing to spend this much on a piece of exercise equipment. For those who like the idea of an adaptive motion machine but aren’t able to afford $12,000, you should definitely check out the much lower priced options from NordicTrack. Their Freestride Trainers operate under the same basic design with interactive fitness tracking technology included.